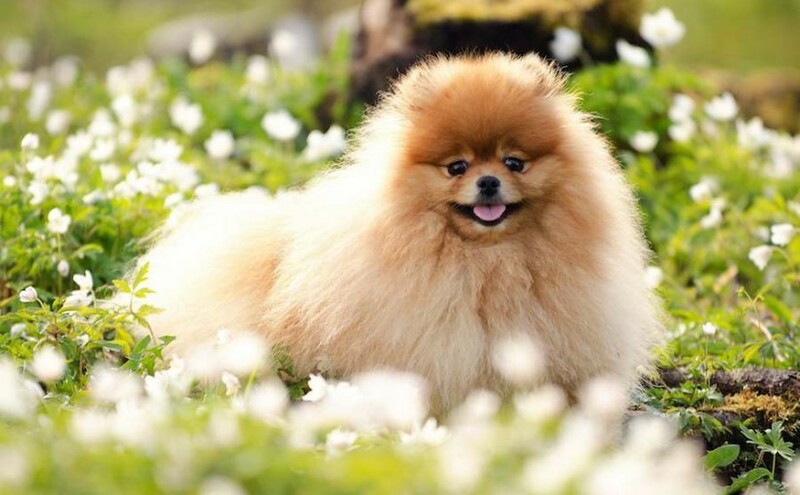 The Pomeranian in build and appearance should be a compact, short coupled dog, well knit in frame. He should exhibit great intelligence in his expression, docility in his disposition, and activity and buoyancy in his deportment, and be sound in action. 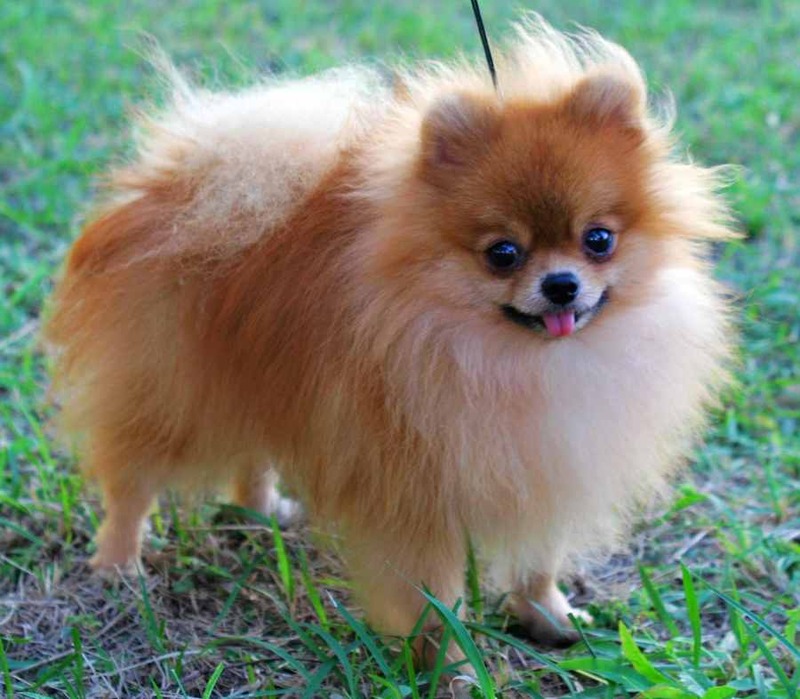 Size: The weight of a Pomeranian for exhibition is 3-7 lb. (1-3 kg). The ideal size for show specimens is from 4-5 lb. (1.8-2.3 kg). Coat and Colour: There should be two coats, an under and an outer coat; the first a soft, fluffy undercoat, and the other a long, perfectly straight and glistening coat covering the whole body, being very abundant around the neck and forepart of the shoulders and chest where it should form a frill of profuse, standing-off, straight hair extending over the shoulders. The hindquarters should be clad with long hair or feathering from top of rump to the hocks. The texture of the guard hairs must be harsh to the touch. Thirteen colours, or colour combinations, are permissible and recognized, namely: black, brown, chocolate, beaver, red, orange, cream, orange-sable, wolf-sable, blue, white, parti-colour and black and tan. The beaver colour is a dark beige. 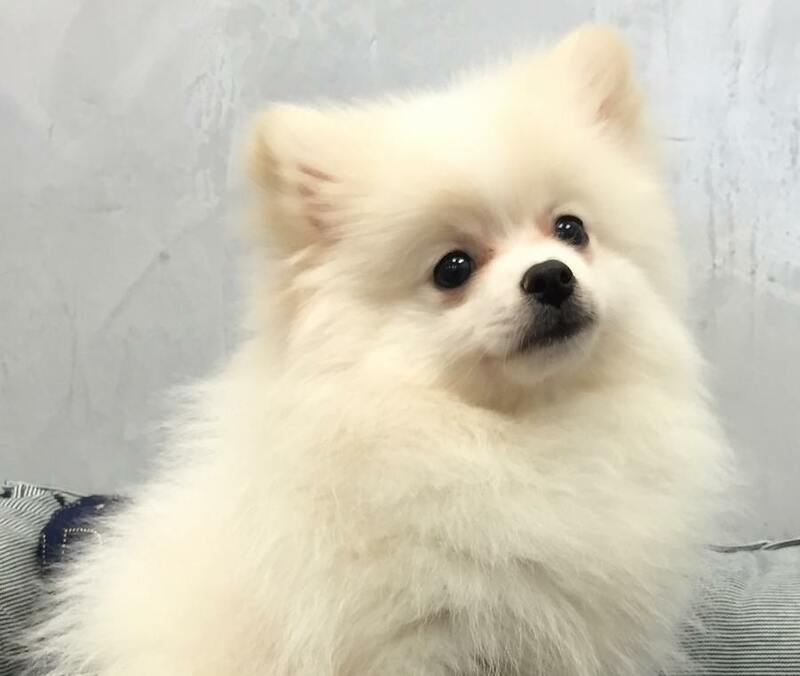 A particolour dog is white with orange or black, colour distributed in even patches on the body, with white blaze on head desirable. 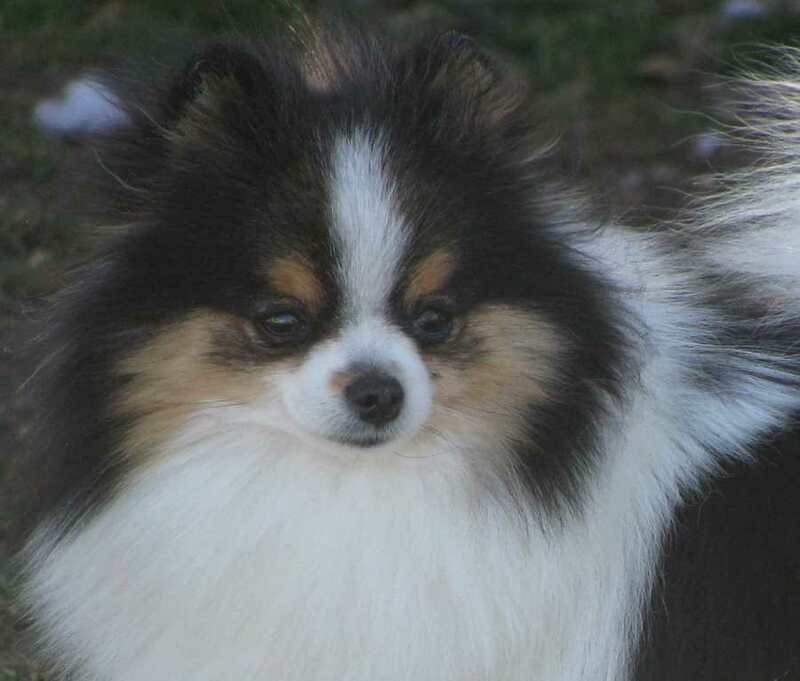 Black and tan is black with tan or rust sharply defined appearing above each eye, in the ears, on the muzzle, throat, forechest, on all legs and below the tail. 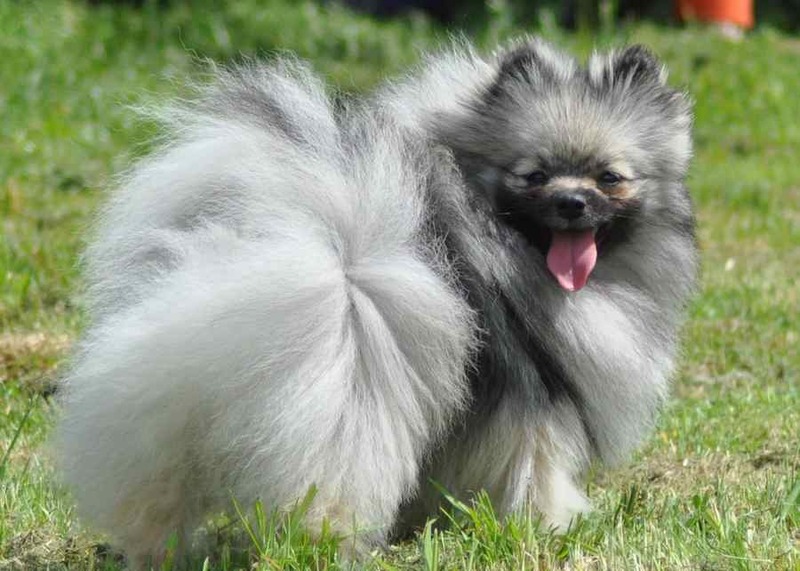 Where whole-coloured and parti-coloured Pomeranians compete together, the preference should, other points being equal, be given to the whole-coloured specimen. 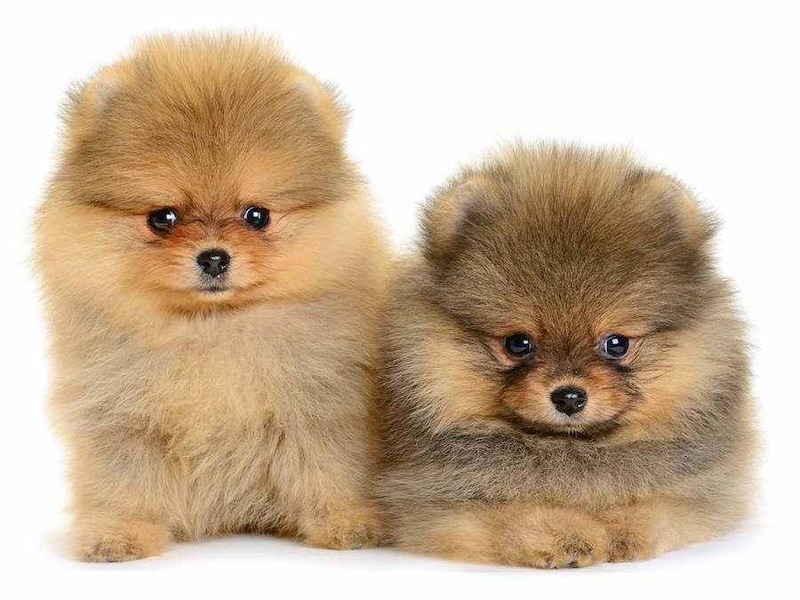 Sable-coloured dogs must be shaded throughout as uniformly as possible, with no selfcoloured patches. 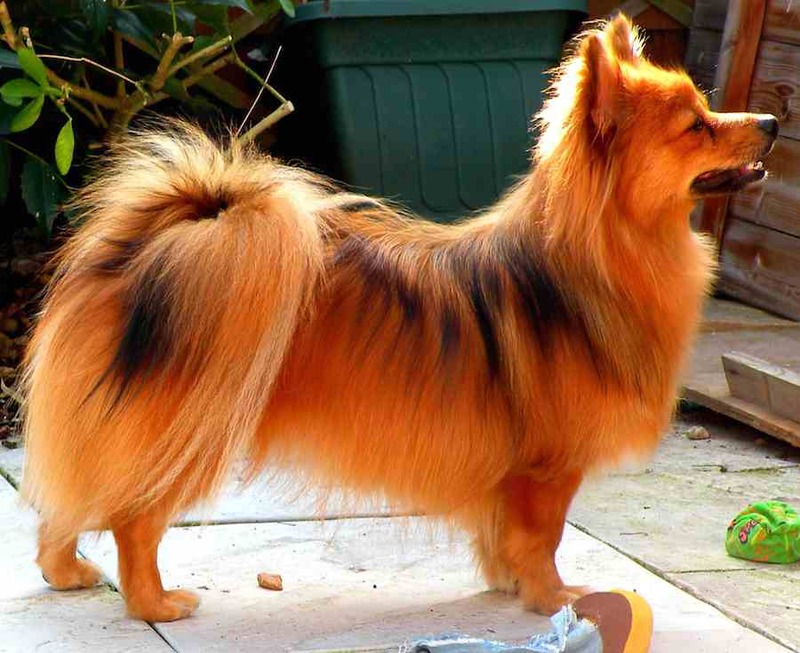 In orange-sable, the undercoat must be a light tan colour with deeper orange guard hairs ending in black tippings. 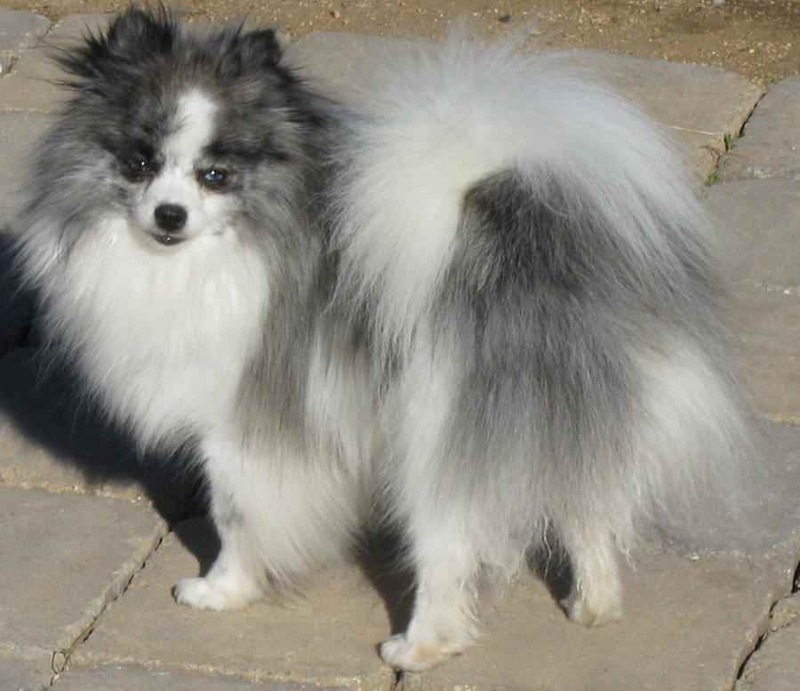 In wolfsable the undercoat is light grey with a deeper shade of steel grey guard hairs ending in black tippings. A shaded muzzle on the sables is permissible, but a black mask on sables is a minor fault. 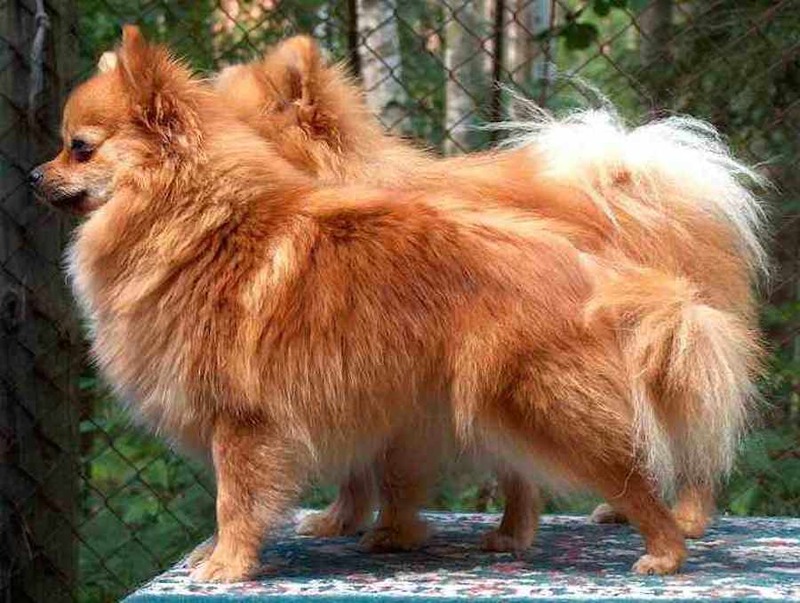 Orange Pomeranians must be self-coloured throughout with light shadings of the same tone (not white) on breechings permitted. 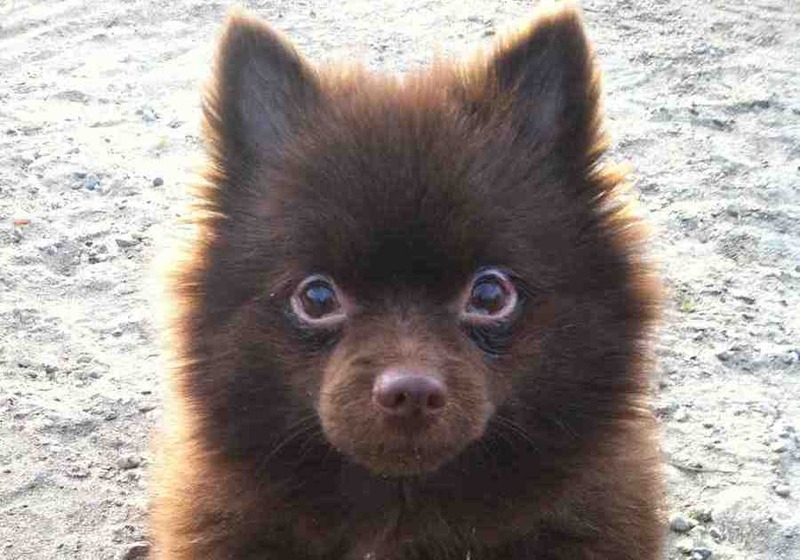 A black mask on an orange Pomeranian is a major fault. White chest, white foot, or white leg on whole-coloured dogs are major faults. 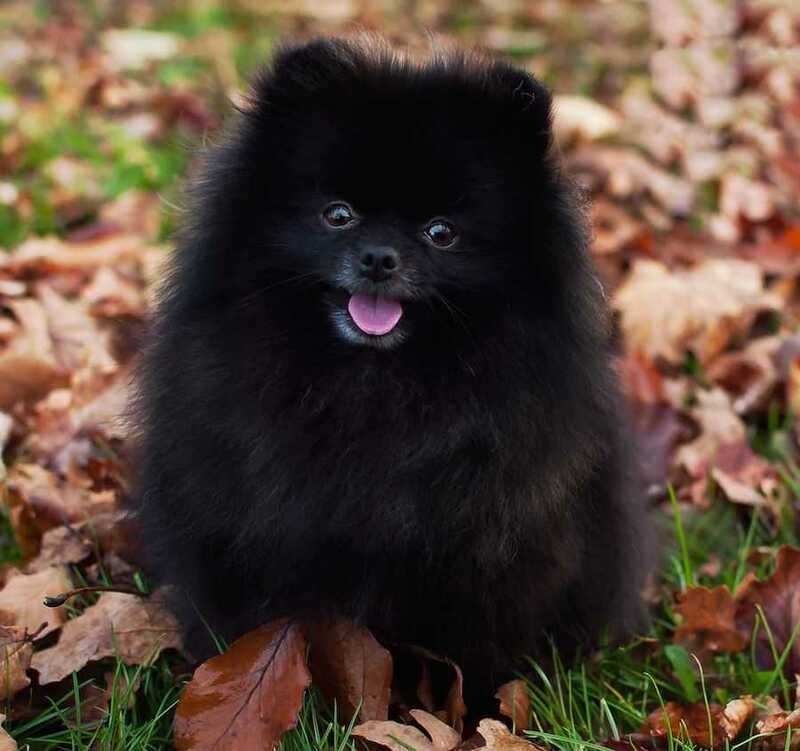 White hairs on black, brown, blue or sable Pomeranians are objectionable. Tinges of lemon, or any other colour, on white dogs are objectionable. 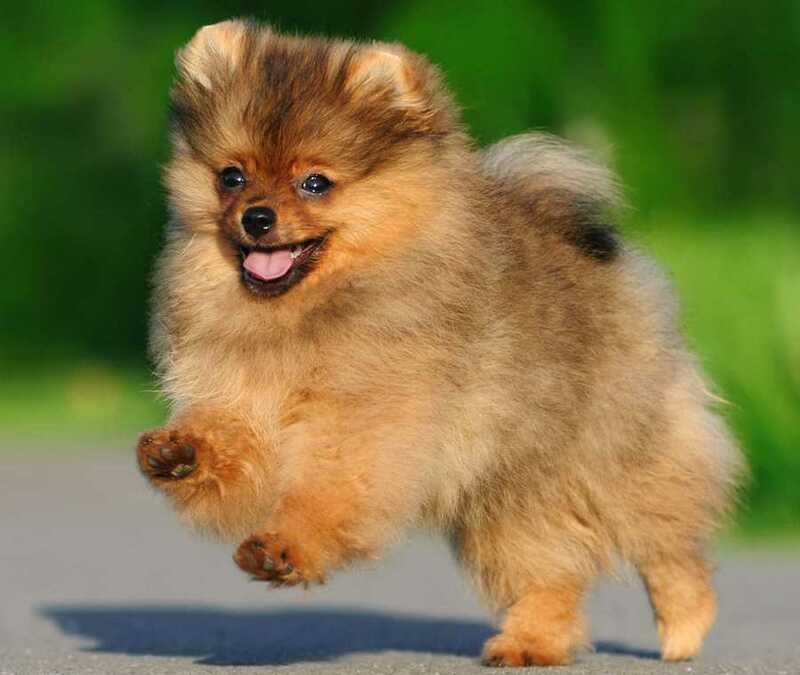 The above colours, as described, are the only allowable colours or combination of colours for Pomeranians. 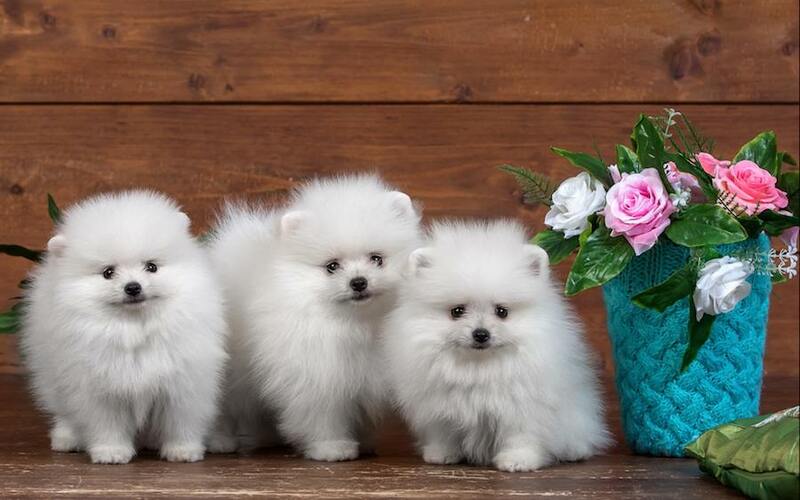 The classes for Pomeranians may be divided by colour in Open Classes as follows: Black and brown; red, orange, or cream; sables; any other allowable colour. Head: The head should be wedge-shaped, somewhat foxy in outline, the skull being slightly flat, large in proportion to the muzzle. In its profile it has a little stop which must not be too pronounced, and the hair on the head and face must be smooth or short-coated. The muzzle should finish rather fine. The nose should be self-coloured in blues and browns. In all other colours should be black. The teeth should meet in a scissors grip, in which part of the inner surface of the upper teeth meets and engages part of the outer surface of the lower teeth. This type of bite gives a firmer grip than one in which the edges of the teeth meet directly, and is subject to less wear. The mouth is considered overshot when the lower teeth fail to engage the inner surfaces of the upper teeth. The mouth is undershot when the lower teeth protrude beyond the upper teeth. One tooth out of line does not mean an undershot or overshot mouth. The eyes should be medium in size, rather than oblique in shape, not set too wide apart, or too close together, bright and dark in colour. The eye rims of the blues and browns are self-coloured. In all other colours the eye rims must be black. The ears should be small, not set too far apart or too low down, and carried perfectly erect, and should be covered with soft, short hair. Trimming unruly hairs on edges of ears permissible. Neck: The neck rather short, well set in, and lion-like, covered with a profuse mane and frill of long, straight hair sweeping from the under-jaw and covering the whole of the front part of the shoulders and chest as well as the top part of the shoulders. Forequarters: The shoulders must be clean and laid well back. The forelegs must be well feathered and perfectly straight, of medium length and strength in due proportion to a well-balanced frame. The feet small, compact in shape, standing well up on toes. Body: The back must be short and level, and the body compact, being well ribbed up and rounded. The chest must be fairly deep. Hindquarters: The hind legs and thighs must be well feathered down to the hocks, and must be fine in bone and free in action. Trimming around the edges of the toes and up the back of the legs to the first joint is permissible. Tail: The tail is characteristic of the breed, and should be turned over the back and carried flat, set high. It is profusely covered with long, spreading hair. Major Faults: Round, domey skull. Too large ears. Undershot. Pink eye rims. Light or Dudley nose. Out at elbows or shoulders. Flat-sided dogs. Down in pasterns. Cow-hocks. Soft, flat, open coat. Whole-coloured dogs with white chest, or white foot or leg. Black mask on an orange. Objectionable: Overshot. Large, round or light eyes. High or low on legs. Long toes. Too wide in hind legs. Trimming too close to show date. Tail set too low on rump. Black, brown, blue and sable should be free from white hairs. Whites should be free from lemon or any other colour. Underweight or overweight. Minor Faults: Must be free from lippiness, wide chest. Tail should not curl back. Black mask on sable. White shadings on orange. 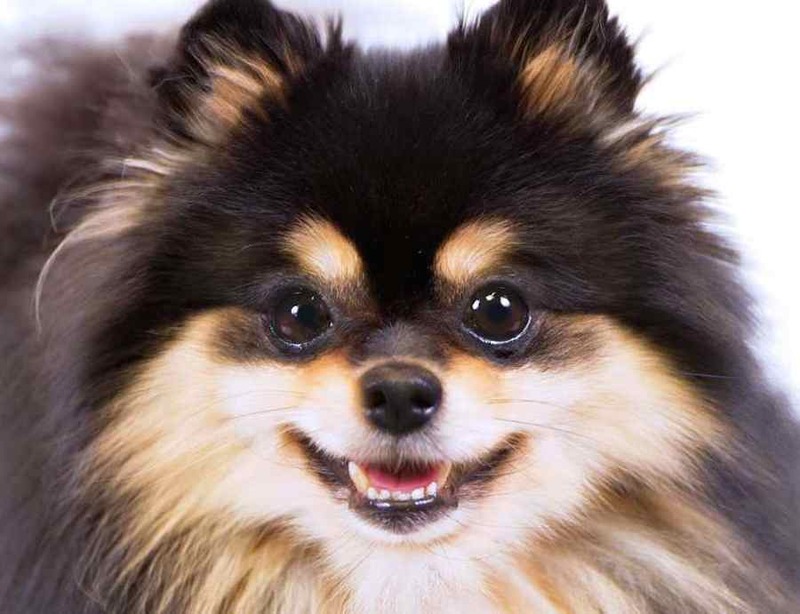 Link: Pomeranian video on Animal Planet.